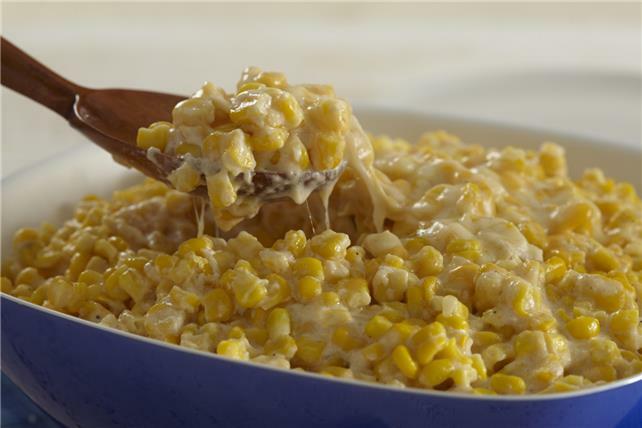 Keep weeknight meals simple and scrumptious with our Electric Pressure Cooker Cheesy Corn recipe. Ready to serve in just 30 minutes, this Electric Pressure Cooker Cheesy Corn proves that great flavor doesn't need to be labor-intensive! Combine corn, sugar and dry seasonings in electric pressure cooker container. Stir in milk. Top with cream cheese, butter and 1-1/4 cups shredded cheese. Close and lock lid. Turn Pressure Release Valve to Sealing position. Cook 15 min. using LOW PRESSURE COOK setting. When timer goes off, use Quick Pressure Release to release pressure. Turn pressure cooker off. Slowly remove lid. Stir corn mixture; spoon into serving dish. Top with remaining shredded cheese. Stir 1 Tbsp. chopped seeded jalapeño peppers into corn mixture along with the milk. Prepare as directed, using PHILADELPHIA Neufchatel Cheese, 1/3 Less Fat than Cream Cheese and fat free milk.